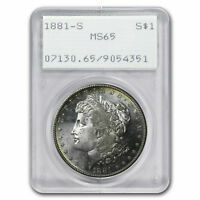 1881 S PCGS MS65 Morgan Silver Dollar $1 PQ Coin! 1881-S PCGS MS-65 Looks PL ! Details about 1881 S $1 Morgan Dollar PCGS MS 65 Uncirculated Rattler Holder OGH Looks Nicer! 1881-S MS64 Morgan Silver Dollar $1, NGC Graded, Colorful Toned! 1881 P PCGS MS64 Morgan Silver Dollar $1 1881-P PCGS MS-64 PQ Coin ! 1881-S MS63 Morgan Silver Dollar $1, NGC Graded, Superbly Toned! 1881 O PCGS MS63 Morgan Silver Dollar $1 US Better Date 1881-O PCGS MS-63 PQ !